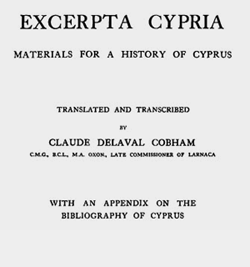 Digital Cobham is a bibliography of material about Cyprus published before 1910 based on Claude Delaval Cobham's pioneering scholarship. It lists over 2000 fully searchable bibliographic entries for books and articles that contain information about Cyprus. Each entry includes a description of the work, links to selection of libraries that hold it, and for most works a link to a digital copy of the work you can immediately read. Basic bibliographic information is provided for each entry including the title, authors, publisher, publication location, year published and a short physical description. Information about editions, revisions, translations of the work is also provided, particularly for earlier works. Most entries provide a link to a digital copy of the work available for immediate reading. Each entry includes links to holdings of the work in major libraries in Britain, America, France, Germany, Greece and Cyprus. 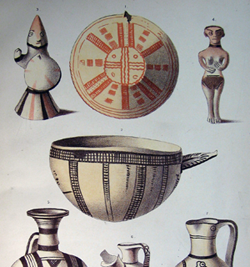 Links to the catalog entries for Cobham's own copies of the works (once held by the Royal Commonwealth Society, now at Cambridge University) are also provided. Entries provide links to bibliographies appropriate to the type of entry where you can examine other ways the works have been catalogued. Digital Cobham includes references to works listed in the 1908 edition of Cobham's bibliography and works referenced in his Excerpta Cypria. It also includes additional material published before 1910 listed by George Jeffery in his revised edition of the bibliography. 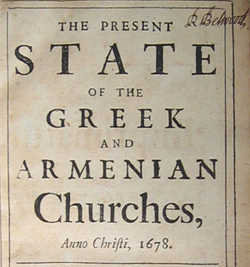 The bibliography has been expanded with references to works published before 1910 listed in other major works about Cyprus along with references provided by users of this bibliography. Currently the bibliography does not include references to newspaper articles, maps, atlases or manuscripts.